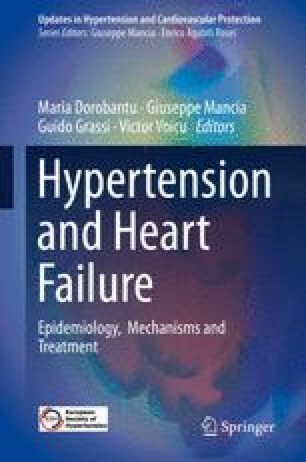 Hypertension (HTN) represents the most important attributable risk factor for heart failure (HF). The measurement of left ventricular (LV) ejection fraction (EF) is the basis for the description of HF in different patients, from those with normal EF (above 50% HF with preserved EF (HFpEF)) to those with reduced EF (below 40%, HF with reduced EF (HFrEF)) . Recent ESC guidelines have identified patients with an LVEF in the range 40–49%, defined as HFmrEF, which in different studies have been considered in the group with HFpEF . HFpEF accounts for about 50% of HF cases, but its prevalence relative to HFrEF continues to rise. HFpEF carries similar risk of morbidity/mortality as HFrEF. Patients with HFpEF are frequently old women with HTN, usually also with diabetes and obesity, characterized by concentric LV hypertrophy (LVH), increased left atrial (LA) size, diastolic dysfunction, pulmonary hypertension, and elevated levels of natriuretic peptides.